Findings from Eurofound’s European Quality of Life Survey (EQLS) show that many of the indicators about quality of life in Turkey are below the EU28 averages. For instance, average life satisfaction in Turkey was 6.0 in 2016, lower than the respective EU28 average of 7.1 (on a scale of 1–10). Furthermore, the share of respondents feeling free to decide how to live their lives stood at 14% in Turkey in 2016, also lower than the EU28 average of 26%. The share of people reporting difficulties in making ends meet has decreased substantially in Turkey during the period of observation. In 2003, 76% of respondents in Turkey reported difficulties in making ends meet, whereas this level fell to 46% in 2016, although still somewhat higher than the respective EU28 average of 39%. According to the EQLS, work–life balance is relatively low in Turkey in comparison to the EU28 average. Of all the surveyed countries, Turkey has the highest share of people experiencing two out of the three work–life balance related problems at least several times a month. Turkey has the highest number of respondents having difficulties to fulfil family responsibilities and also having difficulties to concentrate at work because of family responsibilities. In 2016, 80% of respondents in Turkey have come home too tired from work to do some of the household jobs which need to be done at least several times a month, compared with the EU28 average of 59%. Furthermore, 71% of respondents in Turkey said that it has been difficult to fulfil family responsibilities because of work at least several times a month in 2016, much higher than the EU28 average of 38%. Regarding the third work–life balance problem, some 60% of respondents in Turkey reported having difficulties to concentrate at work because of family responsibilities at least several times a month in 2016, again far above the EU28 average of 19%. The Social Exclusion Index score was 2.6 in Turkey in 2016, higher than the EU28 average of 2.1 (on a scale of 1–5 where a higher value means a higher incidence of social exclusion). Furthermore, only 5% of respondents in Turkey volunteered at least once a month in 2016, significantly lower than the EU28 average of 10%. Turkey also had the lowest share of respondents among all the surveyed countries who felt safe when walking alone after dark, at 13% in 2016 versus the significantly higher level of 35% in the EU28. However, average trust in people in Turkey stood at 5.3 in 2016, which was slightly above the EU28 average of 5.2 (on a scale of 1–10). Additionally, only 25% of respondents in Turkey perceived a lot of tension between poor and rich people in 2016, which was lower than the EU28 average of 29%. The perceived quality of many public services in Turkey was similar to the EU28 averages, and some were perceived to be better than on average in the EU. For instance, the perceived quality of the state pension system in Turkey stood at 6.1 in 2016, higher than the EU28 average of 5.0 (on a scale of 1–10). Furthermore, the quality rating for social housing in Turkey was 6.4 in 2016, also higher than the EU28 average of 5.6. The quality ratings for the seven public services examined in the EQLS have also increased in Turkey during the period of observation. For example, the perceived quality of health services improved constantly between all the survey years, from 3.9 in 2003 to 6.9 in 2016, also rising slightly above the EU28 average of 6.7. Moreover, the perceived quality of the education system increased from 4.5 in 2003 to 6.4 in 2016. Eurofound is currently working on a new working life profile for Turkey. It will be a comprehensive update on industrial relations and working conditions, aiming to provide the relevant background information on the structures, institutions and regulations related to working life. This includes indicators, data and regulatory systems on the following aspects: actors and institutions, collective and individual employment relations, health and well-being, pay, working time, skills and training, and equality and non-discrimination at work. 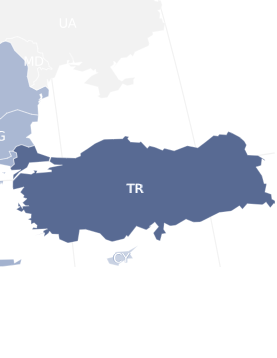 Meanwhile, the previous industrial profile for Turkey is available for download.